partly overlaps the donor (d) site of PTC and/or the nascent peptide path on the 50S subunit, and thus intervenes in the movement of the newly formed peptide group and the adjacent C-terminal section of the nascent peptide during transpeptidation. Longer nascent polypeptides seem to be capable to overcompete the action of erythromycin. Streptogramin B (= mycamycin B = osteogrycin B = pristinamycin IA = vernamycin Ba = PA114B) and related antibiotics, e.g. 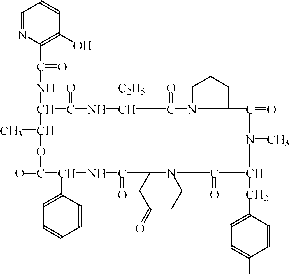 virginiamycins S, doricin, etamycin (viridogrisein) are cyclic hexadepsipeptides containing uncommon amino acids (Fig. 11.10). 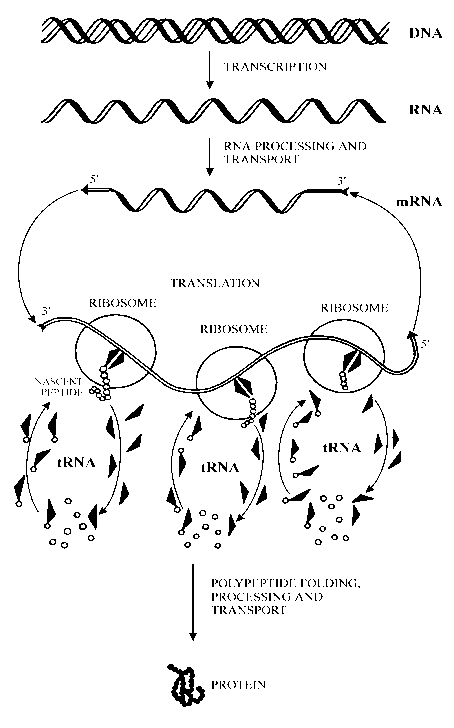 They bind tightly to eubacterial 70S ribosomes and their 50S subunits, but not to eukaryotic 80S ribosomes. Correspondingly, they inhibit protein synthesis specifically in prokaryotic systems, including mitochondria and chloroplasts, both in vivo and in vitro. Their target is PTC. However, as in the case of macrolides, they not always inhibit transpeptidation reaction under model conditions and sometimes stimulate binding of acceptor and/or donor substrates to PTC. Also, their binding and inhibitory effect may depend on the presence and the length of the nascent polypeptide. It is likely that this group of antibiotics acts similarly to microlides, and their main effect can be also Figure 11.10. Streptogramin B. the interference with the movement or positioning of the C-terminus-adjacent section of the nascent peptide within PTC and nearby during transpeptidation. It is noteworthy that streptogramin B affects chemical reactivity of the same residues of the peptidyl transferase region (PTC ring) of 23S RNA that are known to be protected (or sometimes exposed) by chloramphenicol, lincosamides and macrolides, namely A2058, A2062, A2451 and G2505. (Additionally streptogramin B protects A2439 near PTC ring and A752 in domain II of 23S RNA). Also mutations at A2058 confer resistance to streptogramin B and to the antibiotics of three other groups mentioned above: chloramphenicol, lincosamides, and macrolides. These facts strongly suggest a common mechanism of action on bacterial ribosomes for all the antibiotics discussed, despite their very different chemical structures. It cannot be excluded that such dissimilar structures still have identical contacts within PTC ring. An alternative explanation could be the hypothesis that the drugs bound within the same area exert a similar "switching" effect on conformation of PTC; in such a case the protection of A2059-A2062, A2451 and G2505 could be caused by a uniform conformational change ("collapse") of the PTC ring, rather than a result of direct shielding of the residues by the antibiotics. This implies that the three parts of the PTC ring may specifically interact with each other, and they do so in response to the antibiotic binding; mutational changes of the interacting bases prevents the collapse. The inhibition of transpeptidation due to a conformational change of PTC seems to be better consistent with the observations on variability of antibiotic effects and the dependence of the effects on experimental conditions than the direct competitive inhibition mechanism.